The JULES ARTWEAR collection all began in 1993 when I made my first beads with polymer clay. I was hooked! Since the beginning I've been fortunate to make my beadmaking lifestyle a full time endeavor. Exhibiting at about thirty arts & crafts festivals each year and designing custom jewelry for weddings has kept me quite busy. What you'll see here is a small sampling of the line. This collection includes simple styles in basic colors to wear everyday. I think you'll find the prices to be quite reasonable too. More items will be added as often as possible. Custom work is always welcome.Weddings are a favorite! Also, check out my Golden Grain Series and Beads on Leather. I take pride in my work(each and every bead) and stand behind it. Enjoy and thanks for shopping! Earrings, necklaces and bracelets are made with the finest quality Sterling Silver(SS) and Goldfilled(GF) findings. Solid 14kt gold is available on special order. Keep in mind each bead is made by hand therefore the color, size and shape will vary slightly. It is recommended that any coordinating pieces be ordered at the same time to ensure a good match. All beads have a matte finish. A very simple hoop with one small clay bead. Perfect size for multiple pierced ears. Shown in Red and Beige Marble. Basic hoop great to wear with matching 1/2" hoop. Many colors are accented with coordinating glass seed beads as shown on the left pair. Shown in Lavender Marble and Denim Blue. The most popular earring style because they are easy to wear and are very comfortable. Available in round, paddle or rectangle shaped beads. Many colors are accented with coordinating glass seed beads. Clear rubber earbacks are included with each pair. Shown in Emerald Green and Red. Similar in look to frenchwires but with a hinged design that locks securely in the back. Available in round, paddle and rectangle shaped beads. Many colors are accented with coordinating glass seed beads. Shown in Beige Marble and Purple. The most versatile earring style because the bead charms are interchangeable. Charms are available in round, paddle or rectangle shaped beads. A pair of Snap Lock Hoops includes one set of charms. Shown in Black and Emerald Green. Available in round, paddle or rectangle shaped beads. Charms easily slide off when earrings are unlocked. Shown in Pink Marble, Lavender Marble and Lt Green Marble. A basic and versatile necklace on an 18" chain. The Bead Charm is interchangeable. Available in any color in round, paddle or rectangle shaped beads. Together with matching earrings you've got a great look. Shown in Black, Red and Beige Marble. are available in any color in round, paddle or rectangle shaped beads. Charms are mounted on a bail which will slide over the end of the chain. Shown in Red, Emerald Green, Purple, Ivory, and Forest Green. This piece has shape and texture with its three sizes of beads on a 24" chain. The entire cluster is on a bail and can be interchanged. Shown in Purple and Denim Blue. This necklace has the appearance of a continuous chain, but is actually liquid metal beads strung with a strong nylon beading cord. Length is approximately 15" giving it a choker look, but can be made up to 18". Shown in Ivory and Black. This bracelet has the appearance of a continuous chain, but is actually liquid metal beads strung with a strong nylon beading cord. Length is 7", but can be made in any size to fit. This item can also be made into an anklet given the proper size. Shown in Black and Denim Blue. Fish in irresistable bright colors. Approximately 2" in length and on a 24" black cord. Each fish is quite unique in color and shape. Also sold as a magnet-$3.00/each. Available in green, blue, purple or pink. Hearts sweet in their bright purples and pinks. Heart is approximately 1 1/2" and is on a 24" black cord. on backpacks, purses and jackets. Along with the purple, green, pink and blue shown these are also available in brown and black/white. 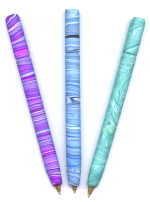 Writing pen in marbleized colors. Each one is quite unique. Pen is a medium point with black ink. It does not have a lid and is not refillable. Available in green, blue or purple. Finally, I need to thank my mom. It is because of her persistence, skill and knowledge that this page is complete. Thanks Mom! This Poly Ring - Polymer Clay WebRing - site is owned by Jules Artwear.